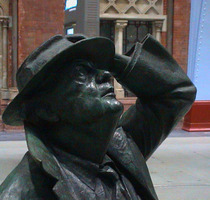 John Betjeman, 1906 - 1984, poet, who saved this glorious station. A misty sealine meets the wash of air. Bronze. Unveiled by Betjeman's daughter Candida Lycett-Green and Poet Laureate Andrew Motion in November 2007. Lovely post from Ornamental Passions. Unveiled in November 2007, this statue was an instant success with the public. At eight and a half feet he is bigger than life-size, but standing on the ground with no plinth, peering up at the splendid roof, he seems one of us. Certainly the other statue unveiled at the same time, "The Meeting Place", at 9m high, has not had the same appeal. On the ground leading to the statue there are five Cumbrian slate discs inscribed with Betjeman quotations. March 2012: plans for a copy of this statue in Wantage, where Betjeman lived for 20 years. Writer and journalist. John Betjeman's daughter.